While the weather’s getting cooler in the Southern States, there’s still plenty of time to enjoy a swim in the pool in Queensland. And for this lucky family in Kenmore, there’s still plenty of time to enjoy their two new poolside pergolas. The pergolas were designed and built by Martyn Hewett from our Kenmore Branch. One pergola provides protection from the sun and adverse conditions over an entertainment area while the other covers an outdoor spa, which will no doubt get more use as the weather gets cooler. Both pergolas were designed to fit into the surrounding environment and create a tropical feel that can be enjoyed all-year-round. 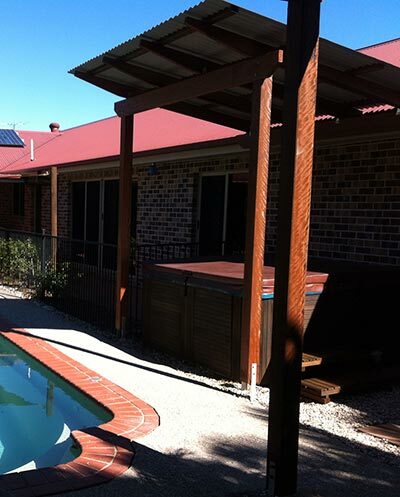 Beautiful hardwood timber was used for the frames of the pergolas, which were then covered with Colorbond metal roofing. “A big thank you to Martyn Hewett at Outside Concepts for the completion of two poolside pergolas for our property; one to cover an outdoor spa and the other a larger entertaining pergola nearby. “We started with a “concept” of what we wanted, held some good discussions about the structure, materials and the look we were after and Martyn came back to us quickly with some draft designs, timber options and quotes whilst outlining his anticipated time frame. We agreed to proceed, the paperwork was simple and reality arrived soon after and it looks fantastic. “Martyn’s process from start to finish was professional, on time and on budget whilst his assistant trades people are tidy and friendly. “I would gladly recommend Martyn Hewett from Outside Concepts who delivered a quality product at a reasonable price”.